We've teamed up with Skillshare to offer 2 free months of classes. 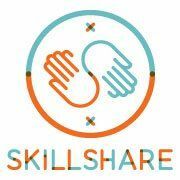 We are big fans of Skillshare and have taken many of their classes to learn new skills. Below you will find some of our absolute favorites from some really talented ladies, all of whom we have either interviewed or they are part of our community! Click on the link, sign up and then use the search tool to find and take these incredible classes! Get 2 FREE months of Skillshare and take Monica's class! Don't forget to get your two months free right here. We can't wait to see what you create! *Freelance Wisdom gets a small kickback when you sign up, help us to continue to add interviews with more amazing women by signing up for Skillshare!